BROADVIEW HEIGHTS: Ric Rac trim and the dining room is done. Quite possibly the most fun trim out there, I wanted to add some to my dining room; make it a little less stuffy. I added it to my shade and to my diy roman shade from mini blinds. So that’s it for my dining room makeover. I’ll add or change it as I go, but I’m really pleased with it. This room has had many updates, and I didn’t love any of them, this one I do. Here is a walk through of it’s various looks over the last two years. It’s a good reminder to me of how my tastes have changed, for the better I might add :) The credit goes to all of you, that continually inspire me to create a space that is truly me. So gorgeous! Love the pleated tablecloth!! Love the bit of "whimsy" it brings to the room. Well done! Wow! that is just amazingly beautiful. You just keep getting better and better. I say "bravo!" AWSOME PICS:) I really like your blog...so much nice inspiration in every post:) I wish you a lovely week. Love the ric rac! That did make a big difference in the room, which looks stunning, by the way! It really has gone through some changes! It looks awesome, Mel! Definitely at it best...but I know...it going to be even more fabulous very soon again..you are the best! What a gorgeous room - and the rick rack trim is such a cute and clever idea! 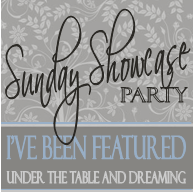 I would love if you came by my party to link this up - I would love to have you there! Oh boy, do I love this! That rick rack is just the cherry on top! Beautiful room- I will be copying you!